Witness the speed and fury of residential fire! This acclaimed video offers a dramatic, first-hand look at the deadly dynamics of fire...from ignition to full room involvement. Ideal for fire fighter training or community fire safety sessions, Fire Power's unique footage keeps viewers on the edge of their seats! Experience a bird's eye view of fire's path of destruction! 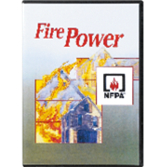 "NFPA®'s Fire Power Video is impressive, dramatic, and focused. It's compelling use of fire footage is very effective in clearing up misconceptions and showing people what a home fire is really like. It's a perfect example of the high-quality we know we can count on from NFPA and why we look to them first and trust them as our #1 fire safety education resource."